Workers install fittings for the facade of a luxury condominium building under construction in New York City on June 29, 2018. Dangers from falling while at construction sites continue to be the most frequently cited hazard by federal inspectors, the Occupational Safety and Health Administration announced Oct. 23. 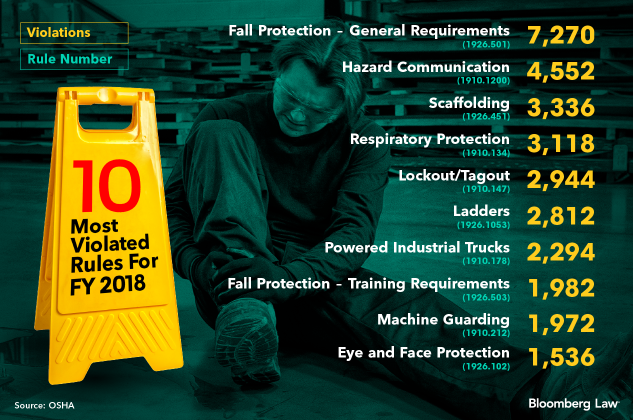 Among the 10 most cited hazards in fiscal year 2018, which ended Sept. 30, four involved potential falls at construction sites, OSHA officials said at the National Safety Council Congress in Houston. The predominance of construction fall hazards, such as falling from roofs or ladders, continues a long-term trend. About half of OSHA’s 30,000-plus inspections in fiscal year 2018 were at building sites. Generally, OSHA requires construction workers exposed to falls of six feet or more to wear protective gear, such as harnesses, or to be protected by guardrails and to be trained on how to avoid falling. Other workplace dangers in the top 10 included not informing workers of the dangers of chemicals and other materials (hazard communications), not protecting workers from dangerous fumes and dust (respiratory protection), and failing to correctly ensure machinery wouldn’t start while being repaired (lockout/tagout). New to the list for 2018 was lack of eye and face protection for construction workers, such as shatter-proof eyeglasses. Off the list was violating electrical wiring requirements (29 C.F.R. 1910.305). 1. Fall protection, 7,270 violations (29 C.F.R. 1926.501). 2. Hazard communication, 4,552 violations (29 C.F.R. 1910.1200). 3. Construction scaffolding, 3,336 violations (29 C.F.R. 1926.451). 4. Respiratory protection, 3,118 violations (29 C.F.R. 1910.134). 5. Lockout/tagout, 2,944 violations (29 C.F.R. 1910.147). 6. Construction ladders, 2,812 violations (29 C.F.R. 1926.1053). 7. Powered industrial trucks (forklifts), 2,294 violations (29 C.F.R. 1910.178). 8. Fall protection training construction, 1,982 violations (29 C.F.R. 1926.503). 9. Machine guarding, 1,972 violations (29 C.F.R. 1910.212). The numbers of violations released Oct. 23 are preliminary. The final tally will likely be higher because OSHA has up to six months to issue citations following an inspection. For example, a problem discovered in August may not be cited until January.